Super Bowl week was robbed of its glory and attention of sports fans by the dramatics going on in the NBA this past week, starting out with Anthony Davis informing the New Orleans Pelicans he won’t sign an extension, forcing the team to put him on the trade market. 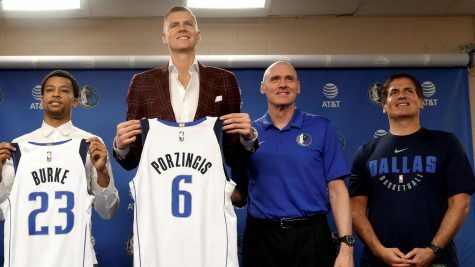 The NBA really stole the show again on Thursday with the blockbuster trade involving the Dallas Mavericks and New York Knicks. With trade talks publicly sparking just an hour before the trade was finalized, the New York Knicks shipped former 4th overall draft pick, Kristaps Porzingis alongside wings Tim Hardaway Jr., Courtney Lee, and Trey Burke to the Dallas Mavericks for Dennis Smith Jr., DeAndre Jordan, Wesley Matthews, the Mavericks’ 2021 unprotected first round pick, as well as Dallas’ 2023 top-10 protected first round pick. Trade talks began and escalated as a result of Porzingis’ meeting with the Knicks’ front office on Thursday going south. Within hours of finding credible suitors to trade with, Dallas had contacted the Knicks and before anyone can fully process what had just happened the trade was finalized. Initially, the trade can seem disastrous for the Knicks. However, by taking a step back and letting it all settle in, it can be more beneficial than meets the eye. Calling this a full-blown salary dump may be a stretch considering what the Knicks got in return. When evaluating a trade, it’s best to look at what the team was before and what the team plans to be after. For the first time since 2010, it seemed like the Knicks were officially in a full-blown rebuild. However, much like 2010, they moved every piece away to attract big-name free agents like Dwyane Wade and LeBron James, but ended up signing Amare Stoudemire to a 5-year deal where he performed well below his value following the first year of the deal. Is this set to happen all over again for the Knicks? Who knows. July seems to be years away, and if they were confident enough to OK this trade, it must mean they have at least some confidence in signing big named free agents like Kyrie Irving, Kevin Durant, Kawhi Leonard, or Jimmy Butler. With Courtney Lee and Tim Hardaway Jr.’s dead money out of play, the Knicks project to have $72-76 million in cap space this summer, and most importantly, keeping their first round pick along with that. Keeping Porzingis was a big risk, especially considering the implications he was giving the Knicks front office during their meeting. The team truly had no reason to feel threatened Porzingis would not sign their qualifying offer. A player turning down a potentially massive multi-year deal is essentially taking a gamble on themselves. In order to pull the trigger on him so quickly, the Knicks must have really felt “the Unicorn” didn’t have a big piece in the team’s immediate future. While evaluating Porzingis’ risks, it goes without saying that banking on a 7’3” center that relies relatively heavily on his athleticism coming off a lower leg injury for a long term deal is very risky. The whole perception of this trade would be entirely different if he was already playing like his normal self pre-injury, but he hasn’t, and has yet to play in a game since going down last February. Sure, DeAndre Jordan is a close friend of Kevin Durant and can be used as a chess piece to recruit the superstar in July, and Dennis Smith Jr. is still a 21-year old prospect, they are just complimentary pieces in the trade compared to the draft picks. Those pieces were the kicker in the trade that can really sway who got more out of it a few years down the line. In simple terms, salary dump + multiple first round draft picks = potential good return. The biggest issue with the Porzingis trade on the Knicks’ side is how avoidable it could’ve been. Whether you want to point the blame at the team’s dysfunctional owner, James Dolan or Phil Jackson’s former reign as President of Basketball Operations, the team has had trouble with its front office. The lone highlight of Jackson’s tenure was drafting a young unestablished Kristaps Porzingis. Jackson was responsible for the bad contract given to Lee, but the even longer, more expensive contract given to Hardaway Jr. (after they traded him away just to years earlier to the Hawks) was given under current President Steve Mills’ tenure. Dennis Smith also came one pick after the Knicks’ draft pick of Frank Ntilikina– a clear downgrade from what they could have gotten. Given the circumstances they laid in at the time of the trade, moving Porzingis to capitalize on the immediate future, is somewhat understandable, but could have been entirely avoided if management made better decisions in the three years prior. On the Mavericks side of things, the trade is just as risky. The trade’s intention on their side is to build around Luka Doncic and find a suitable young cast to be competitive for the long-haul. Is tacking on two bad contracts, giving away two first-round picks, and limiting their cap flexibility for a big immediately coming off an injury the answer? Even if Porzingis agrees to a long-term offer from the Mavs, there’s no certainty that he will be back at 100%. This is a rare occurrence where a blockbuster trade is made that is almost equally as risky for both parties involved. It won’t be until at least the summer that this trade can properly be evaluated as to who really won or lost, and not for many years after to really see the full impact on both sides, but for now Knicks’ fans are still as troubled as ever, Mavericks’ fans are excited about their new young core being built up, and the Knicks traded away their best young player on their roster since Patrick Ewing.